It is oh-so-wonderful when readers get their moms to explain the what, why and wherefore of mid-century decorating trends. Arcalus Bo, who runs his own historic home design consultation in Portland, Oregon, and who also consults on historical issues for Rejuvenation, spotted my new fixation with vintage bargello needlepoint pillows. He knew that his mom Ashley was quite expert on the subject — she once taught the craft — and put me in touch with her. The gorgeous piece above is Ashley’s. She sent me images of a few more — along with an explanation of bargello’s wild popularity in the 1960s and 1970s. …Basic bargello is stitching in a series of graduating hues, one color at a time, in a pattern of peaks and valleys, the width of a canvas. The next row uses a lighter of darker hue than the first, following the same pattern as the first color. Then a third, fourth, etc. hue. Some times the peaks and valleys are straight across (not very interesting) and some times the peaks and valleys are exaggerated (much more interesting). The yarn being used goes over more than one thread and is always linear, rather than stitching intersecting threads like in needlepoint. 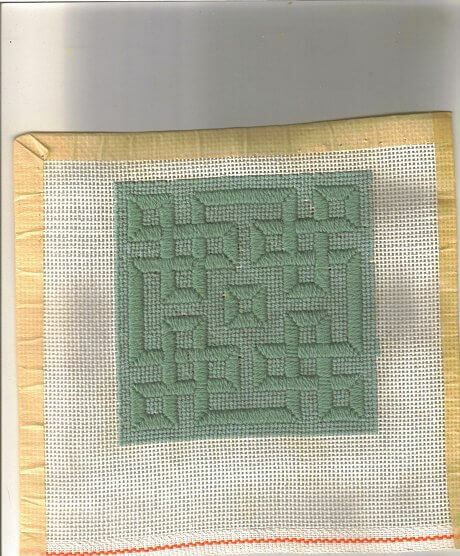 Typing it out makes me realize that that must be the definition of bargello: linear stitches over more than one thread. 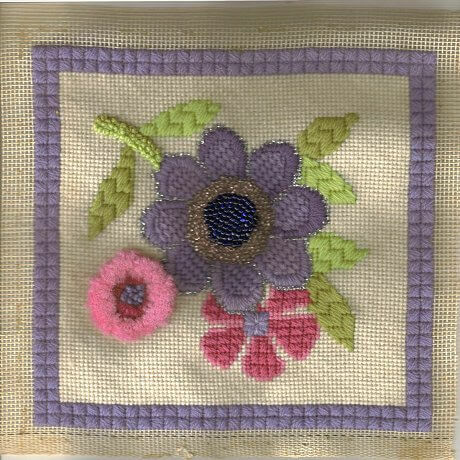 In needlework on canvas (there are lots of different techniques) one never refers to the holes of the canvas, only the threads because the point of the stitching is to cover threads of the canvas. The holes are for the needle to go into. So when one sees a graph, the squares represent the threads – always. I’ve only been able to find one of my completed pieces in the attic, which is a mass of boxes and other “stuff.” The one I found is flowers made in a pattern. I’ll send you a picture. There are a couple of small things that were never made up. The one I particularly wanted to find is a four-way bargello that looks like a kaleidoscope. No luck. It will turn up.The attachments (hope it’s not too many to send all at once!) show some of the things I did just because they were fun to do, with no idea of finishing them. The peach colored little “thing” is a sampler of stitches, not bargello but I called it that so all the files would be together and easy to find… I did a big sampler pillow in cream. It was beautiful but I don’t know what happened to it! If you have any questions I’d be happy to try to answer them. I haven’t done this kind of needlework in ages but I sure loved it as well as crewel embroidery. I taught all kinds of needlework for several years through the Community College here so I was constantly doing something. I did a bargello tote-bag class once. Teaching, I had to keep up with all the new things because students stayed with me for so long. The colors were so garish (think: groovy, psychedelic, yellow/orange, flower children, etc.) but everyone loved them at the time. The bargello was the new “had-to-do” thing is the only way to explain it. Update 2014 from Pam: I heard from author Sherlee Lantz, she recognizes this design as one of those she created in her book “Trianglepoint”. She also says this is not technically known as “bargello”. Seems like I am using the term quite loosely. Suffice to say: I love all these vintage needlework designs — look for these pillows — add them to your home — or make your own. Vintage books like “Trianglepoint” seem like a great way to start. Thanks, Sherlee, for the great information. Your design is gorgeous!
. (Pam notes: *the link to Amazon is an affiliate link, as are all those below; helps keep the blog boat afloat.) She was a leader in the craze for all needlework at that time. 1st published in 1961 before the bargello craze. 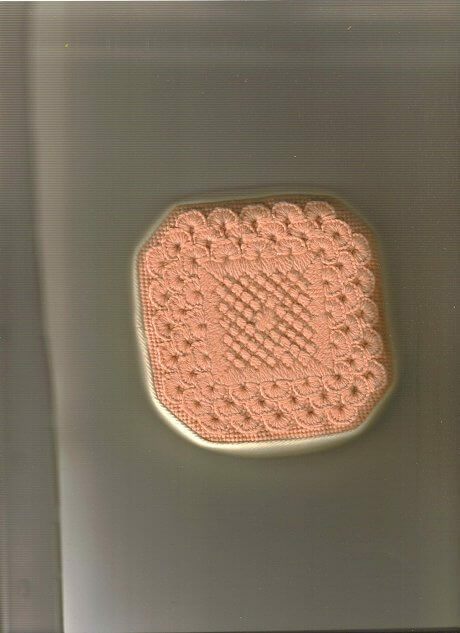 And Pam adds to this list: Sherlee Lantz’s Trianglepoint: From Persian Pavilions to Op Art with One Stitch. The Victorians were big into needlework of all kinds. They often used the bargello peaks and valleys stitched using with beads and basic needlepoint stitches together in the same work. One’s imagination is often the only limiting factor to creativity. Thrift shops and yard sales would be a wonderful place to haunt to find the hot “new” item for ebay! Thank you, Ashley, I really appreciate your sharing this slice of history with all of us. And — let us know if/when you decide to sell any of the bargello pillows in your attic, we will be the first bidders. 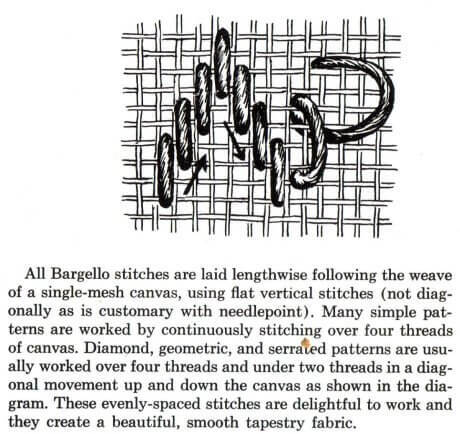 Readers, Ashley also was able to send me some info from Elsa Williams’ book on the history of bargello. I’ll feature more insight from Elsa — queen of bargello — in an upcoming post. I think it is great to encourage people to take another look at the wonderful needlework of the past, but the things you are showing are needlepoint, not bargello. Ashley is right to point that out. Bargello is a type of needlepoint, but all needlepoint is not bargello, but your post sort of flies right over that distinction. I don’t see any pictures of real bargello, and I think it is kind of sad since people will look at what you have posted and think they are seeing bargello, but aren’t. Pictures of bargello are available at http://home-and-garden.webshots.com/explore/bargello if you want to take a look. I think the difference will become clear. Keep up the good work encouraging people to value these lovely art pieces. Hi DawnP, as I recall Ashley did a pretty good job describing what bargello is… I agree, some of the little stitches in her pieces are needlepoint but not bargello. 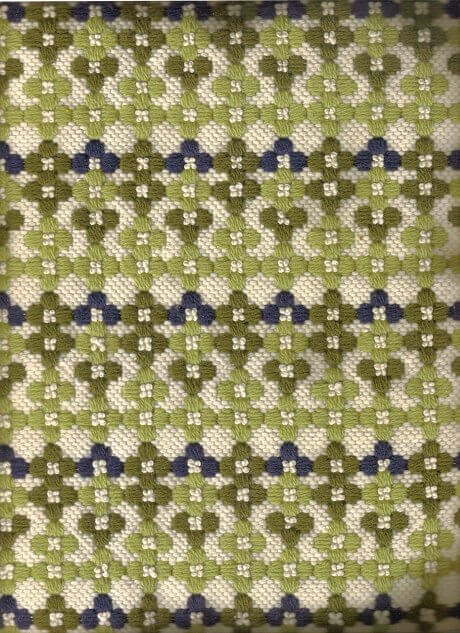 I hope I didn’t come across as the ‘stitching police’ – I didn’t mean it that way, but I felt that some confusion may have occurred due to the visuals and I wanted to help clarify the difference between bargello and needlepoint. Ashley’s explanation of technique was right on the mark, but the pictures didn’t match up. I found a site that is full of beautiful pics of bargello, both traditional and modern. I hope you will check out http://bargelloneedlepoint.com/ – especially since they have a link to your site and lovely things to say about what you do here. I was googling bargello and found this post. 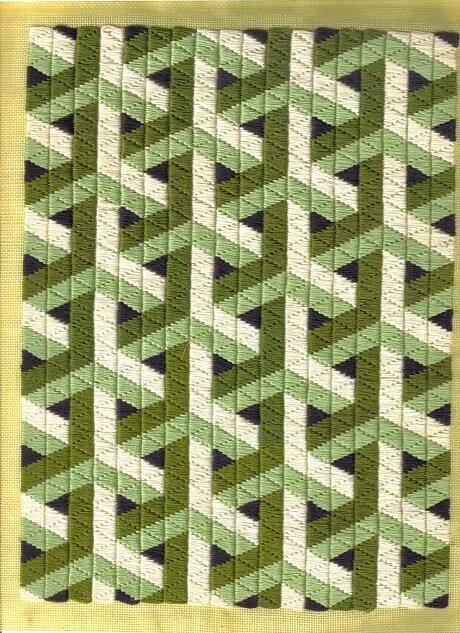 I’m wondering if you know who made the pattern for the green graphic bargello, and where I can get hold of it? No, Ellis, I do not….